The class II division 2 differs from division 1 by the following characteristic: the discrepancy between the upper and lower teeth does not match the discrepancy between the upper and lower teeth where the molars and canines are located (red and blue arrows). The upper incisors are tipped backward and hide the fact that the lower jaw is farther back. Moreover, the upper incisors hide the lower teeth completely. This type of exaggerated vertical covering is called supraocclusion (deep overbite). Notice the upper left lateral incisor which is tipped forward unlike the three other incisors. The classic class II division 2 shows the lateral incisors tipped forward and the central incisors tipped backward. A gingival recession is observed where the upper right canine is located (green circle). 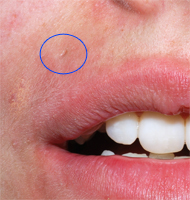 This recession was caused by the rubbing of a piercing jewel internal fastener for which we can see the cicatricial hole on the upper lip (blue circle). A gingival graft of subepithelial connective tissue was necessary to cover up the exposed root and increase the width of the band of keratinized gingiva. Seen from above, the maxillary arch shows an anterior flattened shape compared to a more oblong and narrower shape observed on the maxillary arch of a class II division 1 or a parabolic shape in normal dentition. 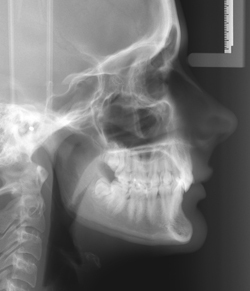 This cephalometric X-ray shows a backward tipping of the upper incisors (linguoversion or palatoversion) that hides the posterior discrepancy of the lower jaw. 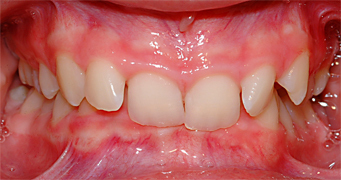 The exaggerated overbite of the upper incisors over the lower incisors is easily recognizable. Notice that the chin projection is anterior to the lower teeth. It is as if the bone segment holding the lower teeth had been retained backward while the basal bone continued its growth forward. This situation characterized by the lower teeth located posteriorly on the basal bone is called dentoalveolar retrusion. 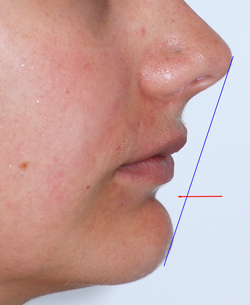 If we draw a tangent line from the tip of the nose to the tip of the chin, you notice that the lips are posterior to this line, which emphases the visual effect of a nose and chin projection. The lower lip is hemmed forward and the labiomental groove is emphasized (red arrow). widthwise: the maxillary arch has an adequate width. 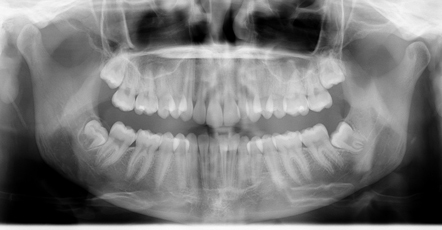 Let’s notice on this panoramic X-ray the presence of the upper and lower third molars which have not erupted in the mouth yet. On the mandibular arch, the third molars do not have the necessary biological space to take position between the second molar and the vertical part of the mandible called the ramus. Their prophylactic removal is recommended since they will not have enough space in the mouth, but also mainly because an orthognathic surgery is planned and the cutline passes through the site of the third molar. We will come back to this subject in another section of this site. I have a question shouldn’t in the above Cephalometric profile view showing the Class II division 2 be a mesognathic profile versus the Retrognathic profile? i am a dental assistant studying for my RDA and studying for the test i came across the Division 2 description: Maxillary central incisors are upright or retruded, and lateral incisors are tipped labially or overlap the central incisors with deep overbite. = mesognathic profile. Please help/explain. I think mesognathic profile is misused. The ceph above show a retrognathic mandible with a low mandibular plane angle (FMA). A classe II div 2 malocclusion has typically retroclined maxillary incisors, proclined lateral incisors often overlapping over the centrals. Some case have 3 or 4 incisors retroclined. The case shown above has 3 retroclined one proclined. The prefix “meso” “dolico” and “brachy” are use with the suffixe “cephalic” but not with “gnathic”. So I don’t understand why your syllabus use mesognathic. 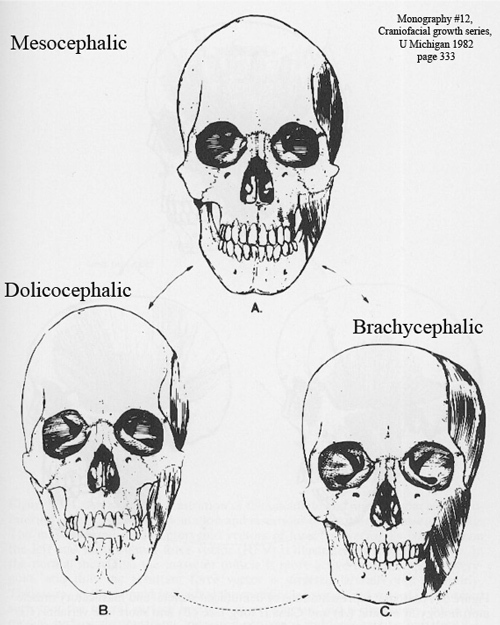 However, mesocephalic mean normal rounded face in the frontal view (picture A) . Brachycephalic refers to a short and broad face (picture C) and dolicocephalic refers to a long and narrow face (picture B). A class II div 2 patient has most often a brachycephalic face, sometimes it might be mesocephalic, but not dolicocephalic. Best regards and good luck for your RDA. If the patient really have a cl II div 2 relationship, lingually inclined central incisors and deep overbite and your ceph tracing show ANB angle < 2°, chances are that you mistraced the ceph. You misplaced either Sella, A point or B point. If the patient really have ANB < 2°, he could have lingualy inclined central incisors that created an anterior crossbite. If this is the case, chances are that your diagnostic is wrong. It is not a cl II div 2 but rather a pseudo class I or a class III. You may also be reading the molar relationship on primary 2nd molars instead of permanent 1st molars. That is what my 18 years of experience of teaching orthodontics to undergraduate student told me. Do you recommend the use of Jasper Jumpers in adults with type II div 1 as a method with less than overjets of 5mm as a treatment plan. Are there any negative effects that JJ treatment may have as opposed to a surgical approach as far as the force applied and the possible effects on bone health post treatment due to the amount of force used in this technique? I am not a user of Jasper Jumpers device. Howerever, this appliance is similar to Forsus cl II corrector most of the fixed functional appliance devices. The main effect is dentoalveolar in both arches. This include mx molar distallization, some upper incisors retroclination, some lower incisors proclination. A class II div 1 with less than 5 mm OJ may seem a mild class II but if the molar are full cusp cl II, it is not a “mild” class II. I have an orthodontist friend form Italy who did a nice reseach with this device and he found it was effective to achieve class I molar relationship. He had no data on stability. I am a dental student. wanted to ask can we have a class ll div2 with a class l molar occlusion on one side and 0.75 class ll molar relation on the other side. Yes it is possible. We call it class II subdivision (on the cl II side). Class II subivision left means cl II on the left, class I on the right. Thank you dr.Sylvain for this informative website. -I would like to know what is the best treatment for dentoalveolar retrusion? does the treatment have complications? -Do you think chin implant is a possible solution cosmetically for lip retrusion? -Does this problem get worse with aging if not treated? If you have dentoalveolar retrusion, you may need mandibular adcancement and genio set back. I disagree totally with chin implant, it will never be esthetic nor bring functionality to the lower lip. You may have have a short face and a diminish vertical dimension of the face. If so, the best treatment coulb be bimaxillary surgery with clockwise ortation of the occlusal plane. See Vertical dimension and facial esthetics. This has been so helpful after looking extensively on the internet as I’ve been classified as having a type 2 division 2 overjet. What do you suggest is the best course of treatment (as a guide) to correct it? I’ve been fobbed off with veneers but these obviously wouldn’t correct the inward lean of my upper teeth. Veneers are definitely not a good option. It will camouflage the misalignment and will not correct the class II skeletal discrepancy. The best tx option is likely orthodontic decompensation and orthognathic surgery to advance the mandible. Depending on your profile, an alternative approach could be extraction of 2 maxillary premolars to align and retract upper anterior teeth and camouflage the cl II discrepancy. You should visit an orthodontist to analyze the best treatment option.